Q: A friend’s Greyhound went in for surgery and almost died from malignant hyperthermia. What is this phenomenon? Is it the same thing as heat stroke? A: Simply put, hyperthermia occurs when a dog’s body produces more heat than can be eliminated by panting and evaporation through paw pads. This means that the dog cannot cool himself off as rapidly (or efficiently) as heat is being produced within his body. Hyperthermia can occur as a result of numerous conditions, such as fever, heat/humidity exposure, exercise, anxiety, and seizures. Malignant hyperthermia (MH), however, is a specific phenomenon that results in rapid, exaggerated heat production occurring from a defect in the way in which calcium is transported through the cells of the dog’s body. This defect leads to a “canine stress syndrome,” a subsequent increase in calcium release from cells, and, in turn, a rapid increase in the amount of heat produced in the dog’s body. 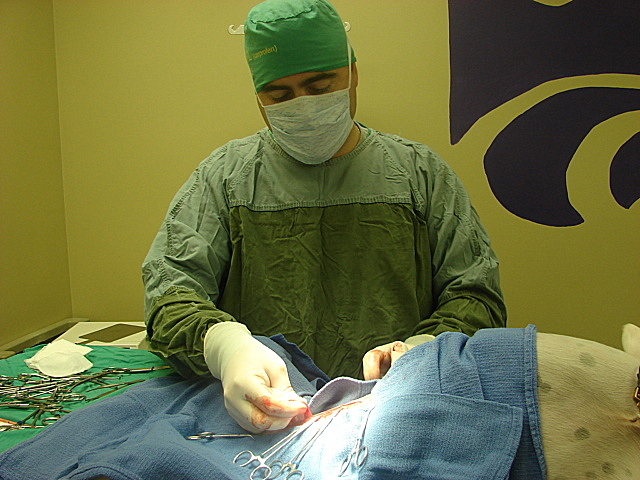 MH may rarely occur after administration of certain types of anesthesia and/or particular drugs used to paralyze the dog’s muscles before and during surgery. In humans and dogs, halothane (a gas anesthetic) and succinylcholine (administered to relax the muscles before a breathing tube is inserted into the dog’s windpipe) are well-known precipitants of MH. In addition, there is thought to be a hereditary component to MH in the human population. DNA testing is often performed before surgery in a human thought (by family history) to be prone to MH. Dantrolene sodium is a drug commonly used to treat MH, and is administered together with a large volume of fluids injected intravenously, oxygen, external cooling (fans, ice packs, etc.) and, in severe cases, cooled fluids injected directly into the abdominal cavity or through dialysis. A Greyhound may survive MH, with rapid diagnosis and aggressive treatment. This is a true veterinary emergency.